A painting depicting the Battle of Manzikert on display at the Istanbul Military Museum. The Turks took their first step in Anatolia with the campaign of Chaghri Beg in 1018. Alp Arslan, the son of Chaghri Beg, reported that there was no power to resist against them in Anatolia and turned the region into a Turkish land, defeating the Byzantine Empire in 1071. After the Khitan people from Proto-Mongols dominated the Orkhon region in 924, Turkic tribes started to migrate West, pushing each other. In 1027, the Turkish migration because of the Khitan pressure soon became a flood. The Oghuz Turks also left their lands thanks to the pressure of the Kipchaks and the Kai tribe. The Shaman Pechenegs and Oghuz Turks migrated to Eastern and Central Europe and the Balkans, while Muslim Oghuz Turks went to Transoxiana, Khorasan and other Islamic countries. As the Great Seljuk Empire could not hold on against the Kara-Khanid Khanate and Ghaznavid Dynasty, Chaghri Beg sent a discovery campaign to Anatolia in 1015 with a 3,000-strong cavalry. 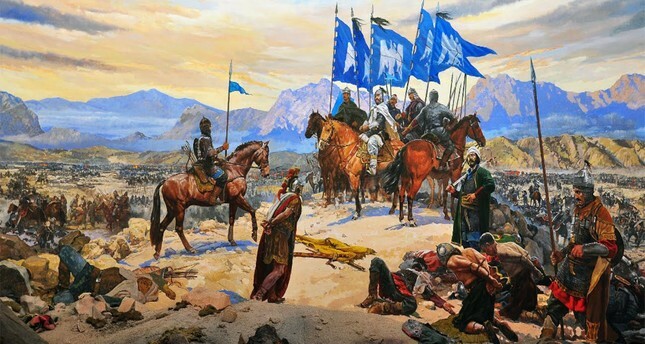 After covering great distances and overcoming various dangers, Chaghri Beg entered eastern Anatolia in 1018, picking Turkmens whom he met in Azerbaijan. According to Armenian sources, Byzantine troops, who struggled with Turkish cavaliers using spears, arrows and bows and long, braided hair, were defeated against the raining arrows of the Turks. Chaghri Beg took Nakhichevan and the surrounding area after capturing the region of Lake Van. He respectively defeated any Byzantine troops he came across. It was easy for him to defeat them with his well-placed cavaliers. A miniature of an 11th-century Turkish warrior on horseback. Chaghri Beg returned to Tughril Beg in 1021, covering long distances, after this successful raid. He reported to family members that they encountered little resistance in Anatolia and encouraged the Seljuk family to campaign, saying: "We cannot struggle with powerful states here, but we can be sovereign by going to Azerbaijan and Anatolia. I didn't encounter anyone who could withstand us." However, the Oghuz Turks defeated the Ghaznavid Dynasty in Dandanaqan in 1040 under the administration of the Seljuks and established their own state thanks to historical developments. As the Seljuks dominated Transoxiana, defeating the Ghaznavid Dynasty, they did not go to Anatolia. Meanwhile, hundreds of thousands of Turks from Central Asia continued to migrate to the West to escape the pressure of Mongol tribes. The region of Transoxiana was not enough to house them, and they started to look for a new home. The Great Seljuks sent Turkmens, who had flooded their country, to Anatolia. The Turkmen masses that started to spread in Anatolia after the Battle of Kapetron in 1048 took over Sivas and Malatya provinces in 1059. In the same year, Chaghri Beg passed away, as well. His son Alp Arslan took the throne after his uncle Tughril Beg's death and succeeded to the throne in 1064. Later, he conquered Kars province. It was in 1067 that Kayseri, Niksar and Konya were conquered. Afşin Bey came to the Bosporus, passing through Anatolia in 1068. Though Turkmens had spread to the eastern and central parts of Anatolia, these places were not safe for settlements, yet. They lacked the skills and power to fight Byzantine troops. As a result, they had to retreat to Caucasus when the Byzantines advanced. In Anatolia, there were also many fortified places and fortresses that had yet to be conquered. It was difficult for Turkmens to take them because they did not have enough weapons for a siege. Seljuk troops were unable to provide protection for every conflict in Anatolia. Byzantine emperor Romanos IV Diogenes started to focus on the Turkmens, who spread in Anatolia after 1068. The emperor worked to expel them from Anatolia, preparing a large army in 1071. On Aug. 26, 1071, the two armies clashed on Manzikert Plain. The Byzantines were badly defeated at the Battle of Manzikert, which started at noon and continued through the night. A big part of the army was put to the sword, while the emperor and many generals were taken captive. The small number of surviving soldiers fled for their lives. Seljuk Sultan Alp Arslan defeated a larger army with his smart battle plan. The Battle of Manzikert ruined the Byzantine army and their strength. The Gates of Anatolia were opened to Turkmens forever. This big move against the Byzantine Empire led to a large influx of Turkmens to Anatolia. Anatolia became Turkey. When did Turks come to Anatolia? Although there are some who date the Turks' arrival in Anatolia to 3000-2000 B.C., these assertions are not widely accepted by historians. European Huns came to Anatolia first at the end of the fourth century. While the Huns advanced to Thrace through the Balkans, the eastern population of European Huns entered Anatolia, passing through the Caucasian mountains. The Hun cavaliers under the command of two commanders named Kursik and Basik reached Malatya through Erzurum. They then advanced down to Çukurova. Even if they had laid siege to modern-day Şanlıurfa and Antakya, they would not have been able to conquer them. The Huns, who advanced to Jerusalem, were unable to hold the region and returned to the Caucasus in 396. However, they did not attempt to settle in Anatolia then or upon returning two years later. The second Turkish arrival to Anatolia after the Huns was the Sabirs. The Sabirs, who established a state in the region among the Volga, Don and Kuban River, took the lands to the south of Caucasus in the sixth century. Later, they raided the modern-day Kayseri, Konya and Ankara regions.